Mira grew up in a savage tract of existence known as Hell’s Highway—a parcel of land for genetically impure humans (Impures) cast out during a savage battle between humanity’s government the NAH) and the Paraspecies. When a cease fire was declared, the two opposing sides retreated, regrouped, but the fight for survival had just begun for Impures forced to exist within a kill or be prey existence. As a runner for The Alliance, Mira ran messages and provisions back and forth between her camp and Redemption—a bartering outpost created by the Paraspecies to help Impures within Hell’s Highway. But for the past two years Mira has been a prisoner of war, detained and tortured in an unsanctioned NAH facility within the lawless lands of Hell’s Playground. Now free, she must risk her life to fulfill a promise made to a fellow prisoner—travel to Redemption and enlist the aid of the Paraspecies. Returning to the outpost, though, means reuniting with the Alpha wolf she’d once hoped to have a future with. As Quadrant Alpha of the most dangerous section of Paraspecies land, the last thing Adrik needs is the Impure from his past suddenly returning after two years. He ripped Hell’s Highway apart searching for her two years ago, and his pack reaped the consequences of his shattered soul. Now, with a civil war threatening on his southern border, the constant battles with the succubae on his eastern border, and the latest command from Headquarters to assume the role of Alpha Commander, he doesn’t have time to wander around Hell’s Playground searching for a secret facility no one believes exists. But the temptation to spend time with the Impure he’d once intended to mate proves too tempting. Together they must heal the wounds their time apart created and find a way to survive the dangers awakened. Dragons, gryphons, and wolves, succubi, mages and half-breeds and impures. Oh My! All of these are present in this tale of betrayal, survival, loyalty and love. Mira was thought to be the Alpha Adrik’s mate. She disappeared two years earlier and had been imprisoned off the radar in a place unknown to anyone connected with Redemption. Worse was she remembered. No one ever remembered they were brain-washed each night. Somehow she was not and they don’t trust her. Somehow she has to get Adrik to believe her and return to free the others imprisoned there especially the one who helped her to endure the torture. The one responsible for her memory not being totally erased, the one she calls Deimos. A favorite scene is after they have destroyed the facility and have stopped on the way back to redemption. Heat settled in his eyes when he looked at her. He closed the distance between them and wrapped an arm around her side, drawing her into a half embrace. She hid her grimace in his shoulder and inhaled his scent. She surrendered to the weakness in her limbs and leaned into his strength. Then all the real fun begins. I love this world, and the way we are introduced to it. The beginning of the book introduces us to the terms we will see throughout this book and future ones. The characters are very diverse yet all bound to the quest of a secure future for not only the paraspecies but the Impures as well. 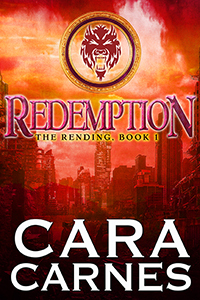 Redemption’s Forgiveness (The Rending, Book 2) is in the most excellent collection Romancing the Wolf .